The issues from Monday afternoon appear to have been resolved by Tuesday morning. Amazon says shoppers had already bought "millions" of Alexa-enabled devices. Rival retailers are still trying to steal some customers online. An Amazon.com employee lifts a box from a conveyor at the company's fulfillment center in Tracy, California. Amazon's website suffered a massive glitch during the worst time possible: the start of Prime Day, its largest shopping event of the year. And it lasted for hours. As traffic funneled to Amazon.com Monday at 3 p.m. 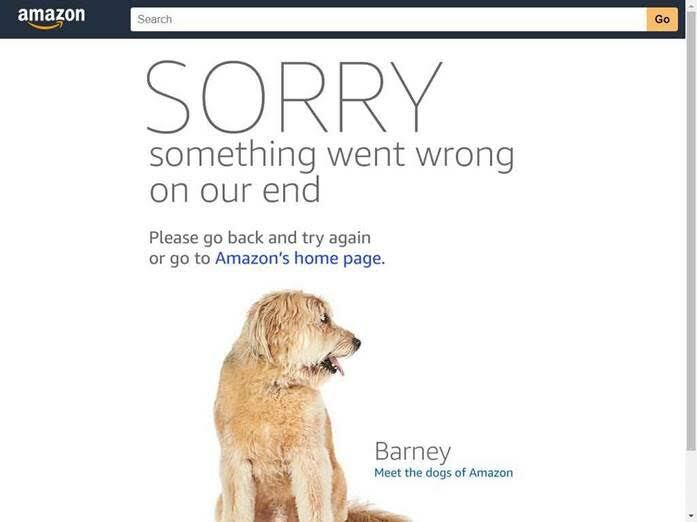 ET, the start of Prime Day, most users looking for deals were instead greeted with images of dogs and a screen that read "SORRY something is wrong on our end." Some users were unable to log into their accounts, while others were unable to use the search function on the website to browse items. Meanwhile, AWS had its own snags. The issues appeared to be resolved by Tuesday morning, with customers reporting being able to ring up purchases quickly again. According to Catchpoint — a firm that monitors retailers' web performance — the glitch lasted until roughly 10 p.m. ET Monday. Amazon hasn't responded to CNBC's requests for comment but tweeted Monday late afternoon that the company was "working to resolve this issue quickly." It hasn't yet said what exactly caused the glitch or why it took so long to fix. Coresight Research had forecast sales to reach at minimum $3.4 billion globally during Prime Day, which would set a new record and surpass Amazon's Cyber Monday sales. Helping the company reach this target is a longer window for deals this year — 36 hours straight. Shoppers had already bought "millions" of Alexa-enabled devices, with the top-selling products being the Fire TV Stick with an Alexa Voice Remote, the Echo Dot, and the Fire 7 tablet with Alexa, according to Amazon. The company also poked fun at its glitchy start, saying: "It wasn’t all a walk in the (dog) park – we had a ruff start – we know some customers were temporarily unable to make purchases." "Compared to previous years, we’re seeing discounts across a much wider range of categories including fashion, groceries, and supplements," Cooper Smith, director of research at Gartner L2, later told CNBC. "There is considerable promotion going towards Amazon’s own private label brands, an area in which Amazon has invested heavily over the past 12 months." CNBC had previously reported on both Amazon's in-house brands and fashion department making a big push ahead of Prime Day. The glitch on Amazon's website Monday afternoon gave rival retailers touting their own deals online the chance to make a bigger splash and potentially steal frustrated shoppers. Bed Bath & Beyond is meanwhile holding a "Beyond Week" of deals, Target is having a one-day sale, and J.C. Penney is holding its own "Cyber in July" special, to name a few examples. H&M's website reads "It's Prime Time!" and the company is offering 20 percent off purchases all day Tuesday. "While Amazon seems willing enough to sacrifice upfront margin for the sake of building its membership coffers over the longer term, we see many of the competing strategies as credit negative for many brick-and-mortar retailers,” Moody’s analyst Charlie O’Shea said. Amazon shares were falling slightly Tuesday morning, having hit an all-time intraday high Monday afternoon ahead of the kickoff to Prime Day. The event was expected to be a significant positive driver for the company’s stock price.